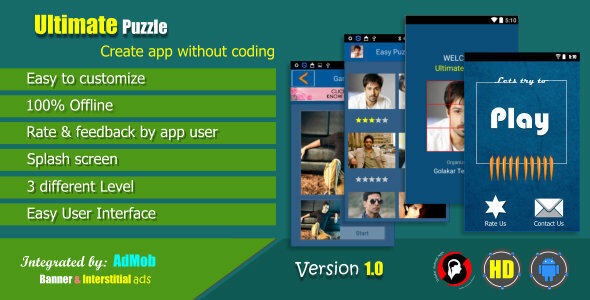 Golakar Ultimate Puzzle app Template is Android application & it’s an Eclipse project. This application lets you to create a Picture puzzle app without write a single code. This app is offline viewing for your android device. These kind of apps are very popular in the Android market and drive huge number of downloads. The application is packed with admob ads integrated to start making money right away. You can add unlimited images for your app. If you want to integration with other ADS network, Please contact with us. “RATE US”- If you Like it, “SHARE”- If you Buy it. Enjoy!! !